Laser hair removal is not for everyone. The absolute requirement is that one's hair must be darker than the surrounding skin. Additionally very darkly pigmented people absorb too much laser energy in their skin and are not candidates for most lasers. These dark skinned patients require the use of highly specialized lasers which are only available at selected laser hair removal centers . Tanned patients with light hair are not candidates. 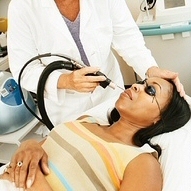 Tanned patients with dark hair cannot be treated with the usual hair removal lasers, also requiring treatment with a specialized laser, such as the kind invented at the Institute of Laser Medicine in Los Angeles (see U.S. Patent 6,595,585). Lastly the treatment cost should be within reach of the patient. Laser hair removal, although much less expensive than electrolysis, requires multiple treatments, and generally costs over $1000 in total for most anatomic areas. Treatment cost varies with the size of the area treated. Experienced laser centers, which have developed expertise in laser hair removal, generally average about $500 per treatment session, with an average of four treatment sessions initially recommended. Large areas, such as the entire back, or the entire legs, cost considerably more than this. Small areas, such as the upper lip, can be less. Individual consultation with the laser center is necessary to obtain exact pricing. Influence of skin color on laser hair removal. Influence of hair color on laser hair removal. Dark hair absorbs more laser energy and is easier to treat. Coarse dark hair responds the best to laser treatment. Light hair is more difficult to treat. Blonde or red hair is very difficult to treat. Multiple treatment sessions are required, and results are variable. Blonde or red hair usually contains pheomelanin, which absorbs laser energy less avidly than the eumelanin pigment which is present in black or brown hair. Laser hair removal requires multiple treatments. Although one laser session can produce long-term hair removal, as a rule multiple treatment sessions are necessary to obtain optimal results. In large part this is due to the fact that laser hair removal is most effective for hair which is in the anagen phase. Anagen is the growth phase of hair. Since hair grows in cycles, not all of the hairs are in anagen at any given time. Additional sessions are necessary to catch all of the hairs when they are in anagen. About permanent hair reduction by laser. Waxing, shaving, and plucking all produce hair removal which is temporary. Several of the newer lasers have clearly documented that there is permanent hair reduction after each treatment. The FDA has approved several lasers for permanent hair reduction, and more results with additional lasers are pending. The results tend to be additive, i.e. more treatments lead to greater degrees of permanent hair reduction. For any given patient results cannot be precisely predicted. Results can be variable, even with the best lasers. Pulsed light and laser hair removal. Intense pulsed light devices can produce effective hair removal. 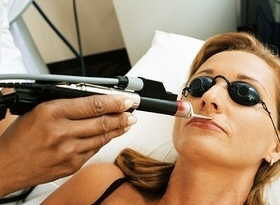 Although these devices are not lasers, they are "laser equivalents", utilizing the same principle of selective photothermolysis to achieve hair removal. These devices are in practice more difficult to adjust than lasers and require great expertise for their proper use. Myths 1: Guarantees in laser hair removal. It is impossible to predict the exact result a patient will achieve with laser hair removal, especially with regard to how many sessions a given individual will require. Many of the hair removal clinics which guaranteed results have gone out of business. Like most reputable medical practices, the most established laser hair removal practices do not guarantee results. Myths 2: Discount laser hair removal clinics. Established medical centers with excellent reputations do not discount their fees. Patients know their reputations and rely upon their experience and expertise. The same is true for laser hair removal. Consumers are advised, as with all forms of medical care, to seek the center of highest quality, rather than lowest cost. Laser hair removal requires exacting science, individual attention, experience, and a trained, caring, professional staff.